Disclosure (click for Disclosure statement): no money, services or payment in kind was received in return for writing this completely unbidden ‘blog post. The Ocean 2000, designed by Ferdinand Porsche and released by IWC in 1982, is one of a dozen or so truly iconic dive watches*. With its offset crown and pebble-like titanium case, there’s a strange other-worldly characteristic to the design that has never really been replicated**. Even in its utilitarian BUND designations, the Ocean 2000 proved to be wonderfully successful, spawning seven varieties, including a completely amagnetic version (ref. 3519). It’s therefore rather pleasing to see IWC recognising this important design in a new model – the catchily-named Aquatimer Automatic Edition ’35 Years of Ocean 2000′. Research into the original Ocean 2000 and its military versions has been undertaken by many*** and there still remains much that we simply do not know about this enigmatic design. Among the authors who have published pieces about these watches are military watch expert Konrad Knirim and Rolex historian James Dowling, while the multi-authored two-piece article in the Horological Journal is seen by many as the font of most Ocean BUND knowledge. However, despite (or perhaps because of) this research, much information relating to the movements, dials and cases of these watches remains unknown. Ferdinand Porsche’s design for the Ocean 2000 took the flowing lines of the earlier Kompassuhr and Titan Chronograph watches and compressed them still further, creating an object of surprising beauty. The all titanium case, integrated lugs and unusual bracelet played with circles in a way that few dive watch designs had before, or since. Marc Newson’s Sea Slug is, perhaps, its spiritual successor, with its equally avant-garde design. But even the Sea Slug lacks the resolutely round case of the original Ocean 2000. 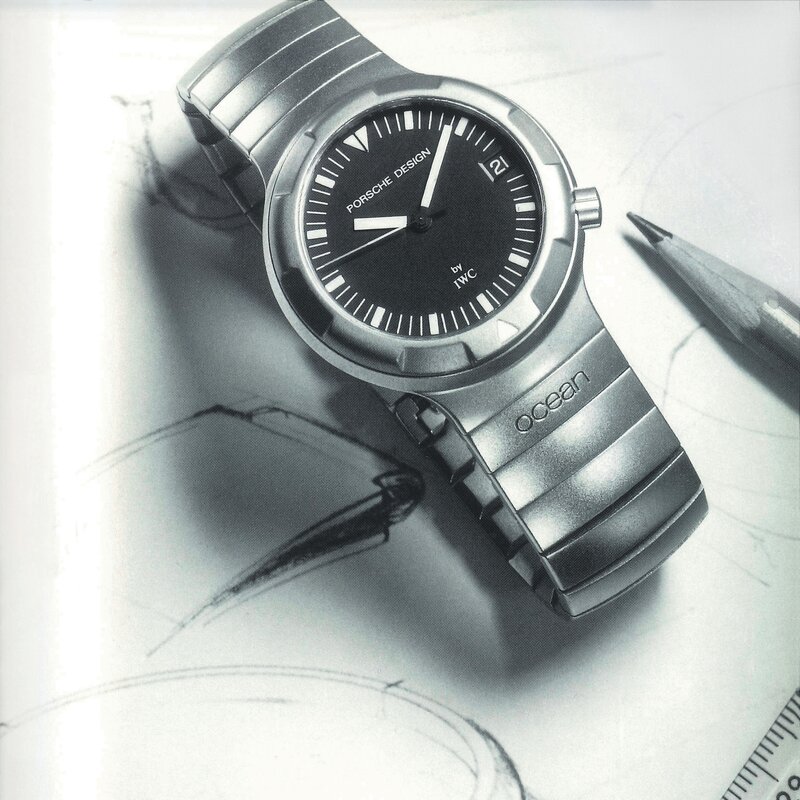 Of course, the overall design was not just about form: the Porsche Design Ocean 2000 had a solidly scalloped working bezel, with a solitary triangle “pip”, that was unusual in that it could be removed and cleaned by the owner. In addition, there were large, strongly-lumed hour and minute hands, and a slender, red-tipped seconds hand – a colour that was also replicated on the dial. The entire package was water resistant to a remarkable 200 Bar (hence the name) and housed in a 42.5mm case. In short, the Ocean 2000 was leagues ahead of its time. Which brings me to the present; IWC has recently announced a 35th anniversary Edition of its Aquatimer Automatic, the “35 Years Ocean 2000″. Whilst superficially resembling the other watches in this range, the water resistance has been significantly increased, and the case is all titanium. Priced at around the £6.5k mark, this is a significant step up from the Aquatimer Automatic, which comes in around £2k cheaper. 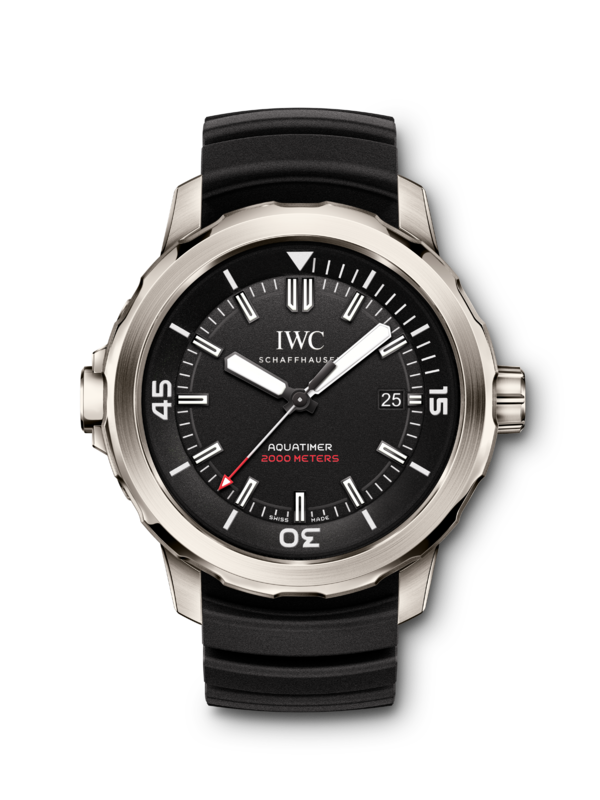 As with all modern Aquatimer models, this version contains IWC’s SafeDive system. This is a ratcheting internal / external bezel with a large pinion to transfer the movement of the external indicator-less bezel to the internal bezel. The oversized pinion balances the large crown, and has been a feature on all Aquatimer watches since the launch of this series of watches in 2014. While the external bezel is bidirectional, the pinion and clutch system only allows the internal bezel to be rotated in one direction. It’s a system that I’ve only used topside, but found to be very enjoyable to operate and one which provides surprisingly tactile feedback. Within the titanium case lies IWC’s 21 jewel cal. A30120 used on the other Aquatimer Editions, the base Aquatimer Automatic watches and a host of other IWC watches. I’m never sure whether this ETA 2892-A2 base is modified by IWC or for IWC, but it’s probably non-controversial to say that it’s a robust, well-respected, if largely unspectacular, movement. This Edition has a high contrast black dial / white hands combination, with a red-tipped triangle-ended seconds hand. Markers are u-shaped and seemingly borrowed from the silver-plated dial variant (ref IW329003). “2000 Metres” is written boldly across the bottom of the dial in red, echoing the seconds hand. That use of red is (perhaps) the only nod to Ferdinand Porsche’s Ocean 2000, and that’s where my main issue lies. There is a great deal of enhanced technology in this watch: it’s basically the same size as the existing 30 Bar Aquatimer Automatic, but with an additional 170 Bar of water resistance. The titanium case is only 0.3mm thicker than the corresponding Automatic, while it is over 30% slimmer than the Aquatimer 2000***. This is not unimpressive, but there is little to remind me of the original Ocean 2000. As a diver, there are a great many watch designs that I admire, and a great many innovations that I use when diving. IWC has been a pioneer in so many areas, including the internal bezel, the incorporation of a mechanical depth gauge and the push-to-turn bezel. It seems odd that in developing a watch to celebrate the 35th anniversary of that revolutionary Ferdinand Porsche design, they have made so little of the technical developments into which so much effort has so obviously gone. Increasing the water resistance to 200 Bar is no mean feat. despite everything, I’d absolutely love to take this one on my next trip to the Lembeh Strait, and, in the end, isn’t that the mark of a good dive watch? It’s not a worthy re-edition. 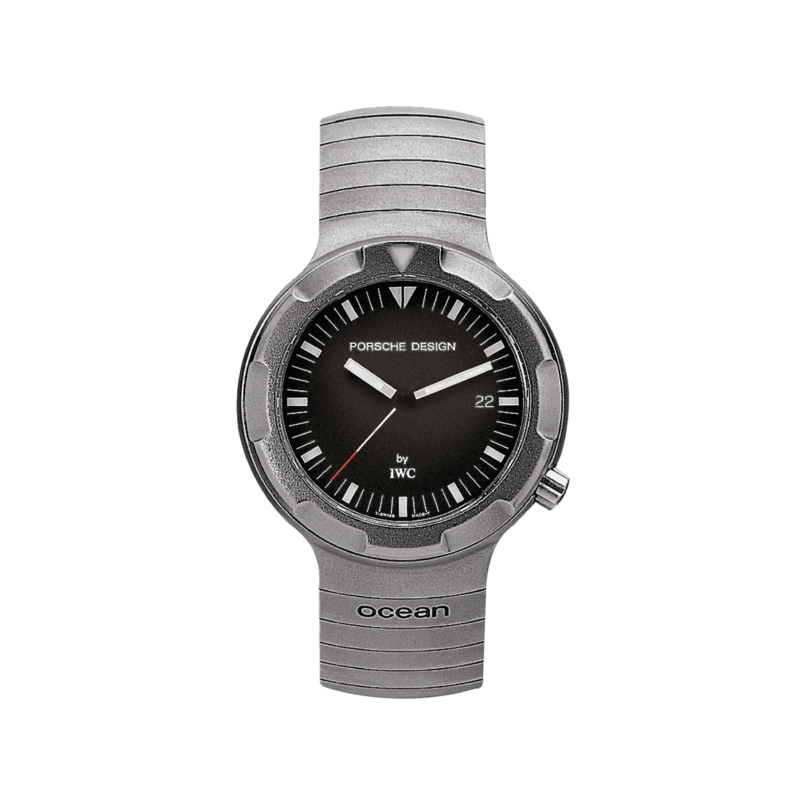 The Ocean 2000 is an iconic piece and was the first to have an all titanium bracelet. This watch does not represent the past to the fullest. What was IWC thinking? The design of new aquatimers are a clumsy mess. Back to the drawing board, I say! I haven’t considered buying an IWC since 2007!